A place to document my life, as I attempt to balance teaching with an active lifestyle. It is a blog full of trails and running, as I experience the loveliness of life with my husband. For what feels like the umpteenth time, I'm dusting off this running blog to share that I've started running again. This time, though, I'm really hoping that it won't go by the wayside like it has so many times before. 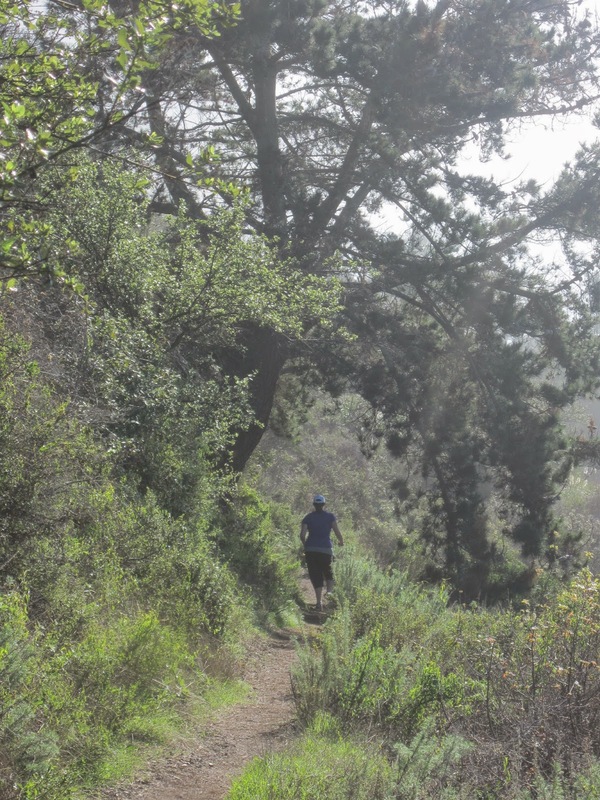 What I think is different is that while running was just a part of regular life before, and so seemed to belong on my other blog as well, now it's my special "me" time, and something a bit separate from our family life. So, we'll try out the two blog format for a while and see how it goes. Enjoying one of the many fun events we did when we moved - "Cork to Cactus" wine festival at the Desert Botanical Gardens. It's funny - since we moved to Arizona two and a half years ago, I really lost all my motivation to run. I'd had no idea how dependent I was on the beauty of my surroundings for my running motivation until I lost it. And, to be honest, blistering temperatures half the year certainly didn't help. 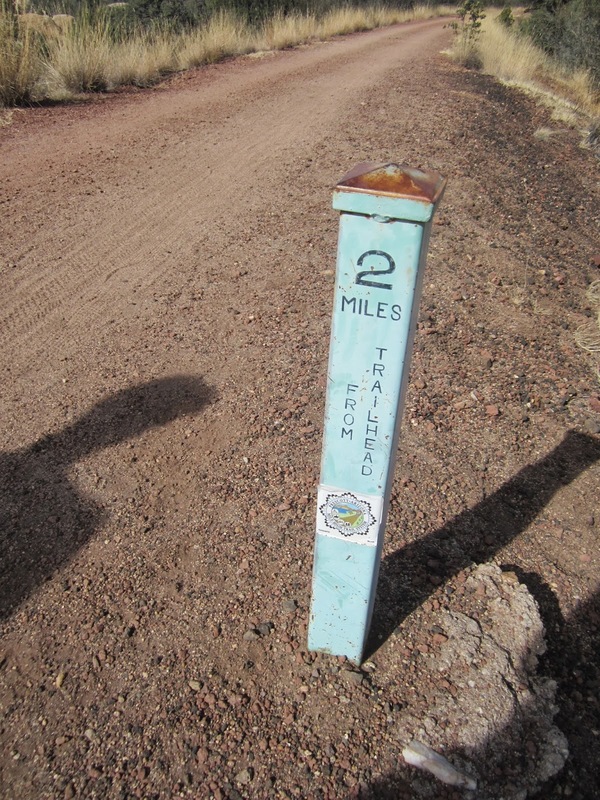 The trails here are brutal, full of rocks and "threatening" plants and were very unforgiving, which made it easy to take a break, pour myself a glass of wine, and decided to give up my runner identity for a while. It was enough to support Ed and cheer him at his trail runs. But, something funny happened when I got pregnant. I had this vision of our family with a little one, and knew without a doubt it included me being active. Of course, that meant facing this state and finding out what it had to offer! To my surprise, I discovered that while trail running here isn't for me, there are many beautiful hikes well within my abilities. 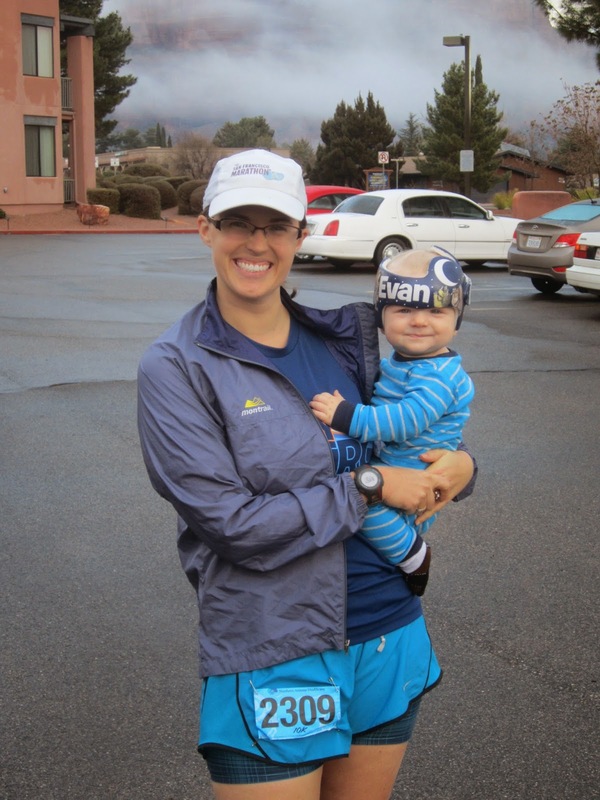 Once I recovered from giving birth (and the blur of those first months of new motherhood), I knew that I wanted to start running. With the clock ticking down to our move back to California, I knew I wanted to be in good shape. And, more than that, I wanted Evan to know a mom that was active, that loved being outdoors, and that was adventurous, things I sort of lost when I moved here. So, I started running. Well, run/walking at first. I spent about 3 months building up from nothing to my first 5k, the Dana Point Turkey Trot, in November. It went fantastic. I earned a very impressive (for me) 32:41, which was a 10:32 pace. In addition to running, I was (and still am) doing a baby workout class twice a week, getting in some much needed strength training that has somehow helped me become fast! Of course, once I did my 5k, I immediately set my sights on a 10k, and picked out a race in our favorite Arizona town, Sedona. The beautiful red rocks immediately calm your mind and body and put you in a very happy place. I don't necessarily buy into the "vortexes" but I can't deny that there is something truly special about this location. I'd like to do a full race report later, so I'll just share for now that it went even better than I expected, considering I didn't look at the elevation chart beforehand, so I didn't realize it was a very hilly course. Despite the hills, I finished in 1:07, for a 10:49 pace (and, if I go by my garmin, which credited me with an extra tenth of a mile, I had a 10:40 pace!). My last mile, even with some uphill, was a 9:50. I'm definitely a runner again, and it feels great. Next up is maintaining this fitness for a few months. I almost always like to go from zero to marathon when I start running again, which is exciting but ultimately less sustainable I think. So, I'm just going to hold steady for now, doing 6-7 mile long runs on the weekend, and 3-4 mile runs a few times during the week. I want to keep hiking at least once a week, and do my baby workout group a couple times a week. I know that this privilege of time will evaporate when I start working in the fall, so I need to make sure I take full advantage of it! For now, I've set my sight on the "Water to Wine Half Marathon" in Santa Rosa in August. It'll be a celebration of moving to our new home, and a last hurrah before I re-enter the workforce. And hopefully in the meantime, I'll have some fun adventures to share. Ever since I started thinking about having kids and being pregnant, in that concrete, sometime in the future way (rather than the "I'm 13 and love babies" way), I had a vision for what I'd be like as a pregnant woman. And, especially once I became a runner in college, that vision always included me being very active. Ideally, I'd still be putting in lots of miles and getting to be one of those women who stayed super strong throughout pregnancy. Then, reality hit. First trimester was sort of a wash with feeling sick all the time. But, at 12 weeks, I was really to recapture that vision. I set a goal of 5 days a week of activity and was hitting it most of the time. I was even running again! Plus, I started doing more hiking than I had ever done in our time in Arizona. Life was wonderful and it felt like I could be that person I'd imagined. 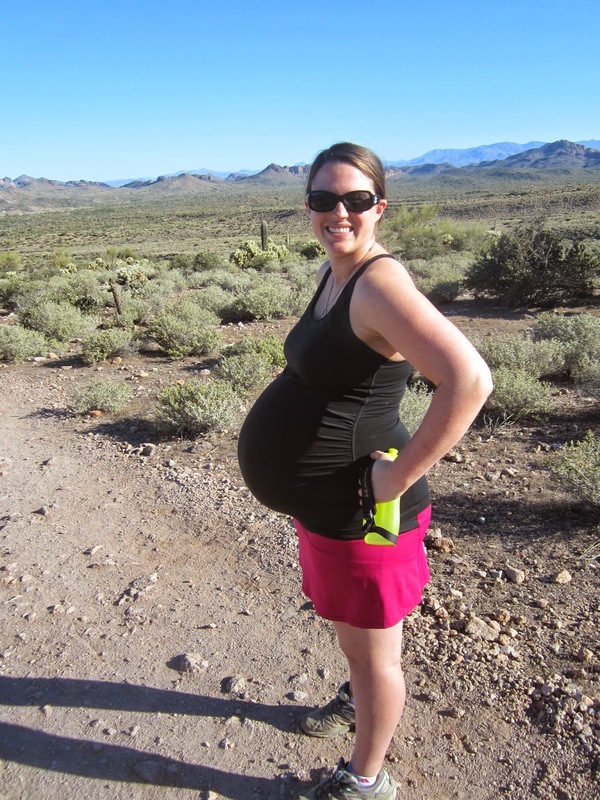 Then I hit 24 weeks, and things started changing. Running became really uncomfortable, so I had to switch to just walking (and was totally fine with that). But then the contractions started. And suddenly this whole idea that I could just push myself to keep doing fun, active things got a very heavy dose of reality. The past 5 weeks have been a struggle, trying to figure out what I can still do - what is safe for me and the baby - and Tuesday and yesterday I hit a wall. 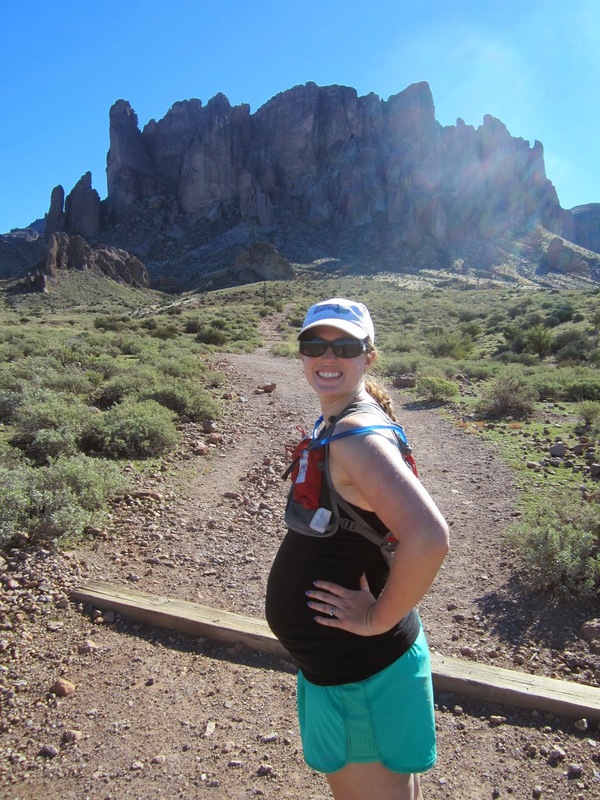 Apparently, going on a challenging hike Sunday was way too much for this pregnant body, and Tuesday afternoon, the contractions that I'd been getting since 24 weeks suddenly became more frequent. As in every 5 minutes frequent. For a frame of reference, it's considered concerning if you get them every 10 minutes, so double that is pretty bad. Having already called and gone in for frequent contractions before (but never this frequent), I knew the strategies to try, and spent the rest of the night trying to get things under control, with some success. But, when I woke up, they were back and in that 5 minute range again. Again, I did my strategies and got them mildly under control, so I headed to work. But it became clear an hour in that they weren't going to do what I needed them to do. After a talk with the school nurse (who is wonderful), a call to the midwives, and a tearful conversation with the school secretary, I was sent home to rest and visit the midwives as soon as possible. The wonderful news is that it doesn't seem like there's a correlation right now between all these contractions and labor. They checked me and did a test that can predict with 99% accuracy whether your body will go into labor in the next two weeks, and it was negative, so that is very good news. I still had lots of contractions all day, but after a good night of rest, they do seem a bit better. This was definitely scary enough, though, that I really do need to rethink how the rest of these 10 weeks of pregnancy will look. My midwife has asked me to get my FMLA paperwork in order so that I can take days off of work here and there when I get a bunch of contractions like I had yesterday, which hit home for me that being as active as I was hoping to still be is out at this point. 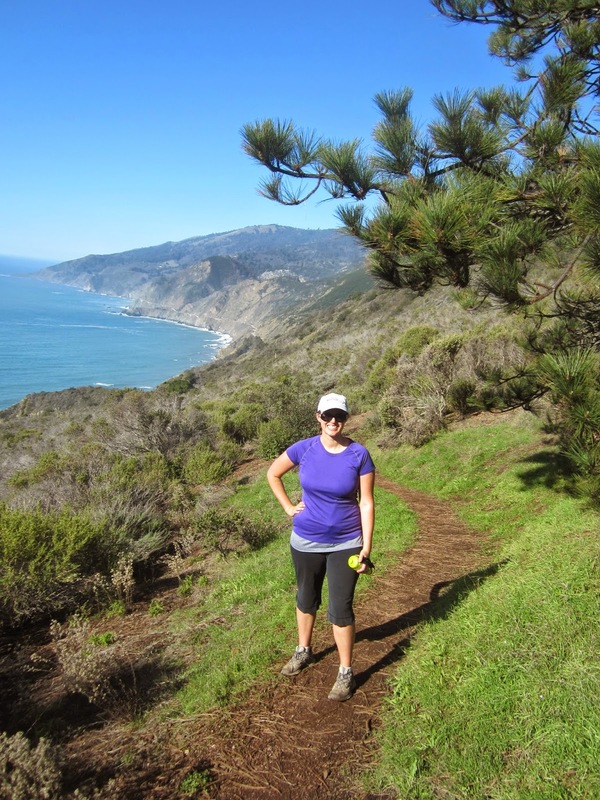 If I can't even always go to work, I certainly can't go out for big hikes on the weekend, or maybe even go to the gym. Thankfully, yoga should continue to be a good choice :). Obviously, I will do anything in the world to keep this little boy of ours safe, but it is mentally very hard to have to know that no matter how "strong" I want to be, I cannot control my body or how it handles this pregnancy. I'm sure there's a good lesson for being a parent wrapped up in there, but for now, I'm just adjusting to this new normal. Hopefully, if I can actually listen to my body and take it much easier, this will be the last big scare of this pregnancy. After all, as my midwife said, it won't be too, too much longer until contractions become a good thing and we'll be ready to welcome our little boy into the world. These pictures are from at least a month ago, but I still wanted to share them, since it was another great hiking experience. Funny, though, how much hotter this was. This was, I think, the last hike I did with just a water bottle, as opposed to a hydration pack. This was a very tough hike, but really great. It was the first hike we did that wasn't flat but was still most manageable. It was pretty open and much more barren than our more recent hikes, but still beautiful. After our hike, Ed went out for a run, while I took a leisurely stroll on the bike path. Yesterday, we had my favorite Arizona trails experience to date. Arizona winter weather has really hit its sweet spot this weekend, with cool evenings and days topping out in the high 60s and low 70s. So, Ed decided to take me someplace I'd wanted to go since we moved here - the Superstition Mountains! I can see these mountains daily as I drive home from work, and their very unique visage has alway made me want to go explore them. However, I was always afraid their trails would be out of my league. Thankfully, the trails were surprisingly lovely! We realized that maybe there is a correlation between paying a park entrance fee and getting nice trails :). Totally worth the $7 to be on trails this smooth. I also decided to borrow Ed's hydration pack for our hike, since on previous hikes, my one bottle of water seemed inadequate. Even though I didn't drink probably even half, since the weather was so mild, it was mentally great to know I had more than enough. The lighting on the trails was just spectacular, and the recent rains meant that a fine layer of grass covered the ground. 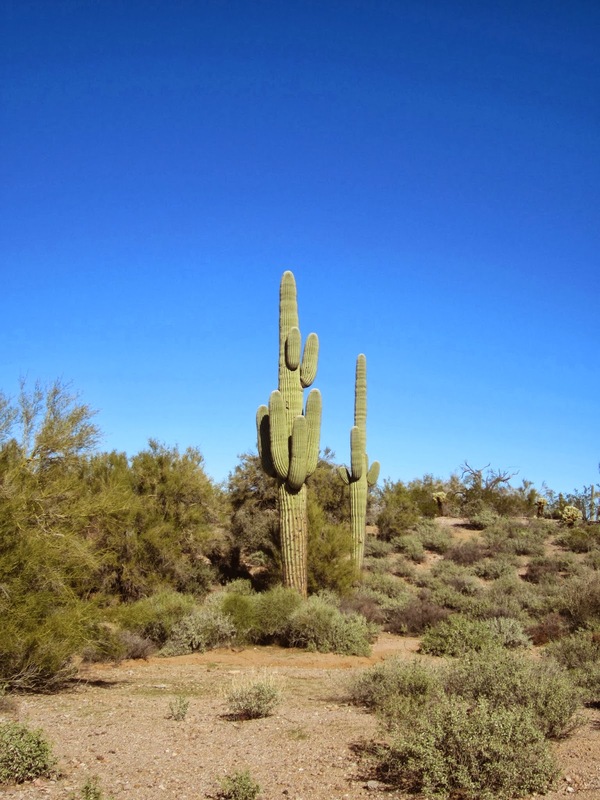 Who would have thought - a green Sonoran Desert? Eventually, we began climbing, which started gradually. Finally, we got up high enough where the sun was blocked by the cliffs, and the temperature dropped at least 15 degrees. Even though it wasn't that hot, being in the shade felt heavenly. Being at the high point also afforded us some more views. At our high point, we made good use of a bench while some horses passed by, and then started our (precarious) downward trek. For future reference, we did this loop backwards. Our downhill was not the smooth, groomed experience we had going up, and I *may* have lost my footing coming down. Not usually a huge deal, but a little more concerning when you're carrying a little one inside. Luckily, it was one of those slow motion falls, where my feet slipped out from under me and I was suddenly not so gracefully sitting on the trail. I did scrape my back a bit on a sharp rock, but otherwise only my pride was injured. Little Evan has been kicking plenty since then to let me know he's no worse for wear :). Ed and I wondered out loud on the hike how he experiences outings like this. How much can he hear? Can he tell we're outside? Can he feel the bumpiness of the trails? As our journey came to a close, we got to take in some beautiful wildlife. Finally, we reached flat land again, and took a few moments to soak in that view for a little longer. Every year on Ed's birthday, we take a little weekend getaway (the benefits of being born near a 3 day weekend). This year, we chose Prescott! Neither of us had ever been there before, and we thought it'd be fun to explore a new place that actually got some seasons. Our first stop was a hike, on the Peavine Trail, a Rails to Trails project that promised a flat, smooth grade, leaving us free to enjoy the day. 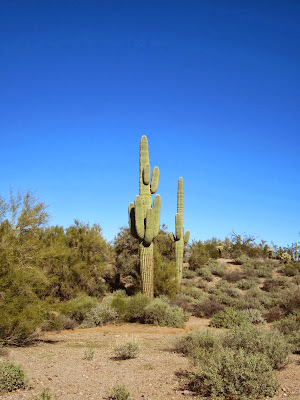 We Phoenix hitting the high 80s that weekend, we were so thrilled to be enjoying mid 60s on our midday hike, and couldn't stop exclaiming about the fantastic weather. It's been a very long time since we've been able to go on a hike at 11am and feel wonderful the whole time. We were featured with some more beautiful views of Watson Lake - a man made reservoir whose rock structures reminded us a bit of Big Thunder Mountain. There was definitely some climbing on rocks to be done, but all in all, it was pretty mild. That said, I was happy that our adventure was short and we got back onto our regular trail. Once we got back on the trail, the sides of the trail started heading upwards. The red granite was everywhere, and quite spectacular. Many more "big thunder mountain" rocks were everywhere, which reminded me not only of Disneyland, but of their inspiration at Squaw Valley. A gap in the rocks showed us another offshoot of the lake. Sometime, it would be fun to come back and kayak here. Finally, we reached our turn around! 4 miles roundtrip might not seem like much, but it's the furthest I've gone since getting pregnant, and I was pretty excited about it (and pretty tired by the end). It's been a very active week, with 2 runs, an intense yoga class, and then this hike. I definitely earned our rest in the hotel later! 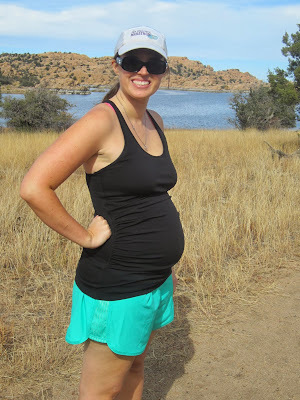 It was fun to try out my new maternity running shirt (from GAP!) and my cheap, new, larger running shorts, that hopefully will work perfectly for the rest of this journey. 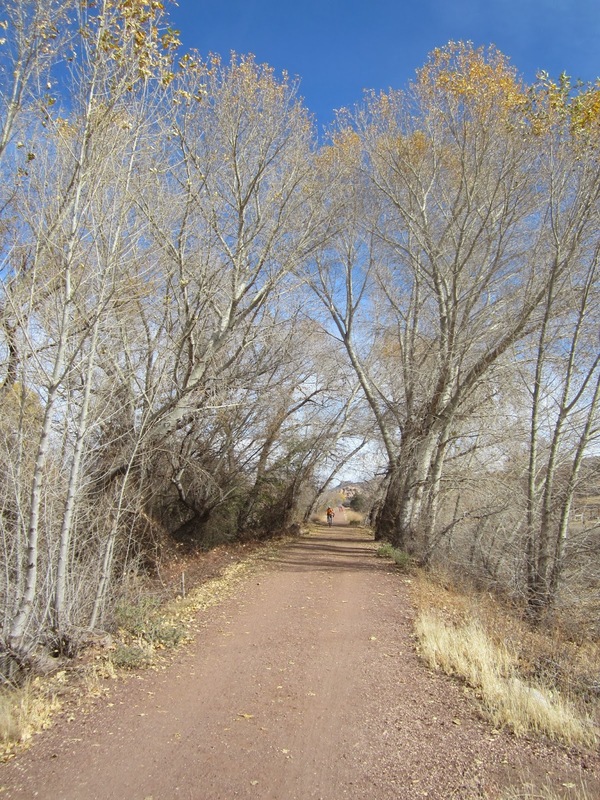 As we finished up that last mile, we both enjoyed how lovely it was to spend this time together, in cool, crisp air, taking in the fall colors. The perfect way to start the birthday celebration! 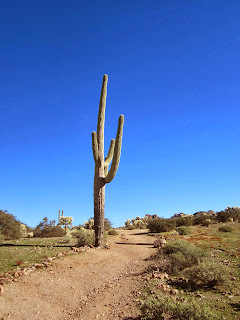 I am a California native currently living in Arizona with my husband of 4 years, Ed. We came here to follow Ed's dream of being a university professor. I just finished my 6th year of teaching, and am lucky enough to be taking this next year off to take care of our sweet little boy.